Should we throw the [corners] in the corner? [game] over. Insert coin to burninate? Do we need to be [changed]? Nothing against it, I'm just curious as it seems to happen more often in that type of questions than in other types (I have nothing to prove this point though). Is it just coincidence, or is it like a Stack Exchange/Stack Overflow tradition? foo is ambiguous because it could refer to wishyfoo or kungfoo. We should disambiguate this. And then everyone says "Aye", because there's no room for debate. This is the stuff of C-SPAN. A joke in your title is a way to capture some interest and get a few more clicks than you otherwise would for your proposal. It's not a coincidence, just a Meta quirk. I'm not sure when it originated, but it happens often enough that people notice it and keep the trend rolling. It's not required, but I have seen tag burnination requests get downvoted for not using a pun in the title if they were posted by someone who has been around the community long enough that they should know the drill. As Josh states, having a canned message of "Should [x] be removed" or "[x] is ambiguous and should be removed" etc. gets old quick, and is also actually harder to search for and recognize. To solve this, witty burninate messages began. Meta in many ways is its own culture and this is just one of those nuances that it has taken on. Personally I like it, because of insert-meta-meme-here1. 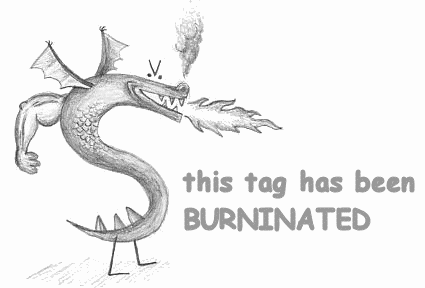 In fact, burninate itself (not urinate) came from a meme which involved Trogdor the Burninator. As a result you will often see him taking care of tags himself. Is it just coincidence, or is it like a Stack Exchange/Stack Overflow tradition? What's your input on [/input]? Should we be using the [/users] tag? And how do we account for [/accounts]? Not the answer you're looking for? Browse other questions tagged discussion meta burninate-system . Why are people who are not on the SO team answering questions about feature-requests like they were part of the SO team? Why are questions with little requester effort penalized? How are feature requests processed and discussed with the SE development and product design staff? Why would people want to delete their own upvoted answer?